Attention All Flex on the Beach Vendors! 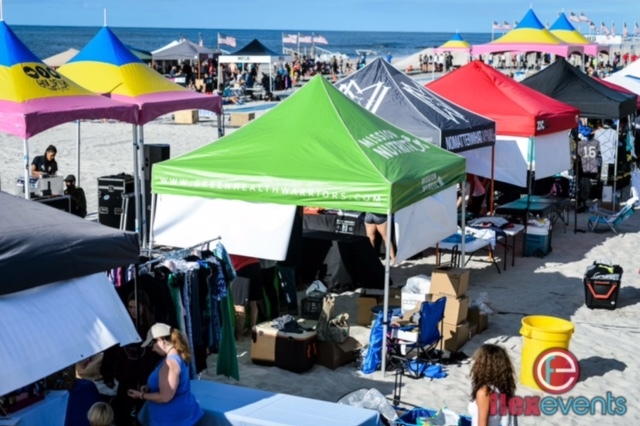 First and foremost, welcome to one of the most exciting events on the east coast: Flex on the Beach! This is our 5th year and we couldn’t be more proud to share this amazing platform with you all! Thank you for choosing to be a part of it. As we get closer to game day, here is some important information. What we ask is that you come Friday between 12pm-4pm to choose your spot. Vendor Village is first come, first serve. You may leave your stuff as we will have a 24-hour security guard to monitor the venue. We will provide electricity, however, if you need WiFi, we suggest you bring your own hot spot. We will also have additional tables on hand if needed. The call time for set up on Saturday is 8am. You can get there earlier if needed. Our team will be on site as early as 6am. Athletes will begin to register at 9am and we will open the door to the general public at 10am. Please do not come any later than 9am. Throughout the day, we will have contest giveaways and loads of fun stuff to keep the folks engaged. On Friday, please let us know if you wish to be involved. If you are donating to the winner’s prize packages, please bring your donations on Friday. In case of rain, we will look to go and play in the rain. In case of thunder and lightning we will delay 30 minutes or until cleared. If it is a downpour and we cannot continue on that Saturday, our rain date will be Sunday the 17th. We are currently at nearly 200 teams! We expect well over 2000 people on the beach! It’s up to you to provide our athletes and spectators with an engaging experience form your booth. Our MC’s will do their best to offer as much exposure as possible. Be creative, friendly, attentive, and last but not least… be awesome! This is the greatest community on Earth: Let’s show them an incredible experience TOGETHER! Let’s get ready to get FLEXY!